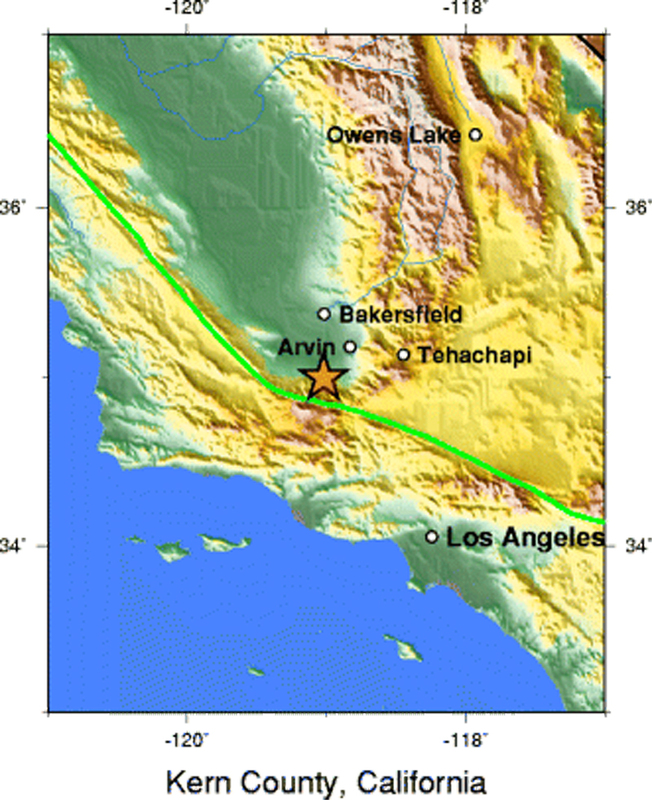 The largest earthquake in southern California since the Fort Tejon earthquake of 1857 and the Owens Valley earthquake of 1872, the Kern County earthquake of 1952 caused immense and widespread damage. The quake occurred on the White Wolf fault, a reverse fault (with some left-lateral component of slip) north of the intersection of the Garlock and San Andreas faults. The area shaken by this quake was impressively large. It was felt in Reno, Nevada, and required a construction effort in Las Vegas to realign structural steel. In San Francisco, it was felt mainly by people on the upper floors of tall buildings. Power outtages occurred in Los Angeles, along with minor building damage. It was felt in San Diego as well, and even damaged one building there! At Owens Lake, about 200 kilometers away, the shaking broke a pipeline and disturbed salt beds, causing damage to a mining operation. The Kern County earthquake claimed 12 lives, was responsible for at least 18 injuries, and caused at least $50 million in property damage. This quake and its aftershocks (at least 20 were of magnitude 5.0 or greater) were responsible for damaging hundreds of buildings in the Kern County area, at least 100 of which had to be torn down. It devestated a section of the Southern Pacific Railroad line near Bear Mountain. It wreaked havoc on agriculture in the Arvin area, where the land has been reclaimed from the Kern River Delta, creating conditions which amplify the shaking of an earthquake. Slumping and surface rupture caused irrigation breaks and subsurface movement disturbed well output. Major relevelling had to be done in many places. The Kern County quake came as something of a surprise to geologists and seismologists. Not only was the White Wolf fault not previously considered a major threat, but the size of the quake seemed disproportionate to the length of the fault which ruptured. The White Wolf fault is traceable for only about 48 km (34 miles), much less than the fault length typical thought necessary to produce such a major earthquake (compare this to the nearly 400 km (250 miles) of the San Andreas fault which broke in the magnitude 8 Fort Tejon quake of 1857). The amount of displacement at the surface also seemed small for the energy released. It is possible that much of the fault is buried, leaving no surface trace. The greatest slip may have occurred well beneath the surface, so that only a meter or so of slip was seen at ground level. Deep rupture and a non-vertical fault would also provide much of the "missing" rupture needed to explain the quake's large size -- a shorter but deeper rupture on a fault with a significant dip would release as much energy as a lengthier, shallow rupture on a vertical fault, since it is rupture area, not merely length, that determines the energy released in an earthquake.